Haunted Magazine: POSSESSION IS NINE TENTHS OF THE LAW..... 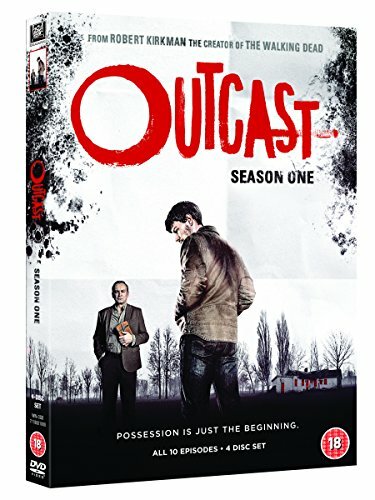 WIN OUTCAST DVD AND IT'S TEN TENTHS!! IT'S YOURS THEY CAN'T TAKE IT OFF YOU!! And as most iconic US TV shows do it has a splice of British in it, as it has our very own Philip Glenister in it (Gene Hunt, Life on Mars & Ashes to Ashes / Quinn, Mad Dogs / and now Reverend Anderson, Outcast). 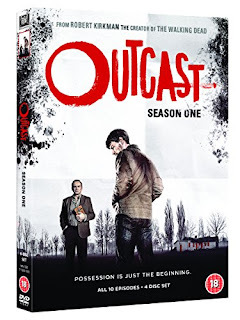 From the creator of The Walking Dead comes OUTCAST, the horrifying new series arrives on Blu-ray™ and DVD from 12th December 2016, courtesy of Twentieth Century Fox Home Entertainment. OUTCAST, based on the Skybound/Image Comics title by creator Robert Kirkman and artist Paul Azaceta, follows Kyle Barnes, a young man who has been plagued by demonic possession all his life. Now, with the help of Reverend Anderson, a country preacher with personal demons of his own, Kyle embarks on a journey to find answers to obtain a normal life he has never known. But what Kyle discovers could change his fate — and the fate of the world — forever. Patrick Fugit (Gone Girl, Almost Famous) stars as Kyle, a man searching for answers, and for redemption, who sequesters himself from those he loves for fear of causing greater hurt. Philip Glenister (Life on Mars) stars as Reverend Anderson, a West Virginia evangelist who believes he is a soldier in God’s Holy War against the forces of evil on Earth. An inveterate drinker and gambler, he doesn’t believe God intends people to sweat the small stuff. Gabriel Bateman (Stalker) stars as Joshua Austin, an eight-year-old who lives across town from Kyle. To his family’s dismay, Joshua appears to be in the clutches of demonic possession, but there’s something very different about this possession and its connection to Kyle Barnes. 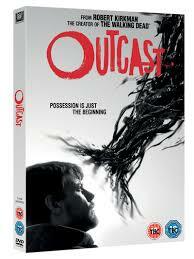 OUTCAST also stars Wrenn Schmidt (Boardwalk Empire) as Kyle’s adopted sister and child psychologist, Megan; Reg E Cathey (House of Cards) as Chief Giles; and Kate Lyn Sheil (House of Cards) as Kyle’s ex-wife, Allison Barnes. ICONIC OPENING SEQUENCE - SPLATTTTT!! What you gotta do? I hear you cry in your tens? It's simple, wherever you see this post, share, like, comment, beg, plead with us for a prize. The more you do, the more chances you have of winning. The competition closes at midday tomorrow (12pm UK time 11/12/16) and we will do what we always do and get some random from the local area to pick out three names, these three names will get the DVD direct from the distributors... (it's like a modern day nativity scene, except the three Kings are all bringing the same gift, Outcast Season 1 on DVD, they should've spoken to each other. ABOUT TWENTIETH CENTURY FOX HOME ENTERTAINMENT: Twentieth Century Fox Home Entertainment, LLC (TCFHE) is the industry leading worldwide marketing, sales and distribution company for all Fox produced, acquired and third party partner film and television programing. Each year TCFHE expands its award-winning global product portfolio with the introduction of new entertainment content through established and emerging formats including DVD, Blu-ray™, Digital HD and VOD. Twentieth Century Fox Home Entertainment is a subsidiary of 20th Century Fox, a 21st Century Fox Company.